Uganda, 2006. World factbook map. The Republic of Uganda is located in East Africa, and is bordered on the east by Kenya, on the north by Sudan, on the west by the Democratic Republic of the Congo, on the southwest by Rwanda, and on the south by Tanzania. The southern part of the country includes a substantial portion of Lake Victoria, which is also bordered by Kenya and Tanzania. The total area of Uganda is 236,040 km2 (91,136 sq. mi.) and the 2009 estimated population was 32,369,558. The official languages are English and Swahili, although multiple other languages are spoken in the country. The people of Uganda were hunter-gatherers until 1,700 to 2,300 years ago, when Bantu-speaking populations migrated to the southern parts of the country. The United Kingdom placed the area under the charter of the British East Africa Company in 1888, and ruled it as a protectorate from 1894. As several other territories and chiefdoms were integrated, the final protectorate called Uganda took shape in 1914. 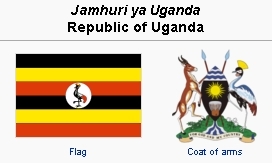 Uganda gained independence from Britain on 9 October 1962. In 1971 Idi Amin seized power, and ruled the country with the military for the next eight years. Amin's rule cost an estimated 300,000 Ugandans' lives. Africans of three main families of ethnic groups – Bantu, Nilotic, and Central-Sudanic (traditionally called Nilo-Hamitic) – constitute most of the population. According to the 2002 census, the following ethnic groups were reported: Ganda 16.9%, Nkole 9.5%, Soga 8.4%, Kiga 6.9%, Teso 6.4%, Langi 6.1%, Acholi 4.7%, Gisu 4.6%, Lugbara 4.2%, Nyoro 2.7%, other 29.6%. The religious affiliation of the Ugandan population was as follows: Roman Catholic 41.9%, Anglican 35.9%, Pentecostal 4.6%, Seventh-day Adventist 1.5%, Muslim 12.1%, Sikhism & other 3.1%, Baha'i 0.3%, None 0.9%. Mennonite Central Committee (MCC) began work in Uganda in 1979 in what was intended as a short-term war reconstruction effort. It related primarily to the Church of Uganda because there was no Mennonite or Brethren in Christ Church in Uganda, and because, until late in 1986, there was no active ecumenical council. The MCC program then shifted from war reconstruction to a reconciliation effort. It spread to various parts of the country working with a variety of ethnic and church groups in an attempt to manifest a peace witness in a society wracked by unending conflict. In 1986 there were six MCC workers in Uganda. Six others had to be reassigned to other countries because of unsafe conditions. Administration of the Uganda program, previously centered in Nairobi, Kenya, was transferred to Uganda in 1986, with full-time program administrators based in Kampala. In June 2004, the Kenya Mennonite Church sent John Otieno, their first international missionary, to southwestern Uganda. By December 2006 four congregations had been established in unchurched areas of Uganda, and a national Mennonite conference was formed. Showalter, Jewel. First Ugandan Mennonite Church Seeks Registration. Mennonite World Conference. Web. 10 October 2008. http://www.mwc-cmm.org/en/index.php?option=com_content&task=view&id=142&Itemid=108. Wikipedia. "Demographics of Uganda." Web. 24 April 2011. http://en.wikipedia.org/wiki/Demographics_of_Uganda. Wikipedia. "Uganda." Web. 24 April 2011. http://en.wikipedia.org/wiki/Uganda. Maxwell, Daniel and Joyce and Richard D. Thiessen. "Uganda." Global Anabaptist Mennonite Encyclopedia Online. April 2011. Web. 18 Apr 2019. http://gameo.org/index.php?title=Uganda&oldid=132082. Maxwell, Daniel and Joyce and Richard D. Thiessen. (April 2011). Uganda. Global Anabaptist Mennonite Encyclopedia Online. Retrieved 18 April 2019, from http://gameo.org/index.php?title=Uganda&oldid=132082. Adapted by permission of Herald Press, Harrisonburg, Virginia, from Mennonite Encyclopedia, Vol. 5, p. 895. All rights reserved. This page was last modified on 8 July 2015, at 16:24.